preceding leg This trip is part of a series. Between 2012 and 2017 a group of four walkers completed the Thames Path from the Barrier to the source, in 22 legs. Why that way? Well, although uphill, a climb of 120m spread over that many days is not exactly arduous. I, for one, preferred a country to a city ending. And as we all came from the Bristol area, walking towards home was psychologically more satisfying. When we reached the source (completely dry, as usual) we decided to extend the walk to include the Thames & Severn Canal walk (aka The Cotswold Canals Walk), which was fairly local for us. For me this had the advantage that I could complete my third continuous chain of squares 'from sea to shining sea', or more prosaically from tidal water in the North Sea to tidal water in the west. The others were Hadrian's Wall (another Geo-trip of mine) and a long chain from Aberystwyth to Lowestoft (completed over many years and not lending itself to a Geo-trip). 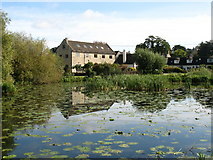 The Cotswold Canals Walk runs from Lechlade to the River Severn at Upper Framilode. 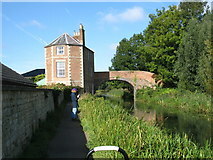 It is 66 km long, most of which follows the route of the old Thames and Severn Canal, though the final stretch was known as the Stroudwater. 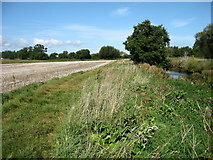 However we had already walked from Lechlade to Thames Head on the Thames Path, and chose not to repeat that, even by a slightly different route. Instead we walked about 35 km from Kemble to the Severn, in 3 legs. For various reasons I was unable to photograph every square in the chain when we did the walk (especially on this leg), but this was local country and it was easy to revisit and fill in the gaps. But the Geo-trip rules do not allow for those photos to be included! The third and final leg, 11 km, took us from Ryeford to Upper Framilode. 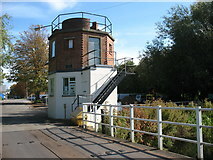 We passed under the M5 by a pedestrian underpass near junction 13, and over the Gloucester and Sharpness Canal by a swing-bridge.